The detached house "Sonnenstrasse 39" was built in 1959. Since then, various improvements were made. The starting point of the retrofit "Step 1" in winter 2013/2014 was a situation where the house should be modernised with an overall refurbishment plan and efficiency goals in mind. 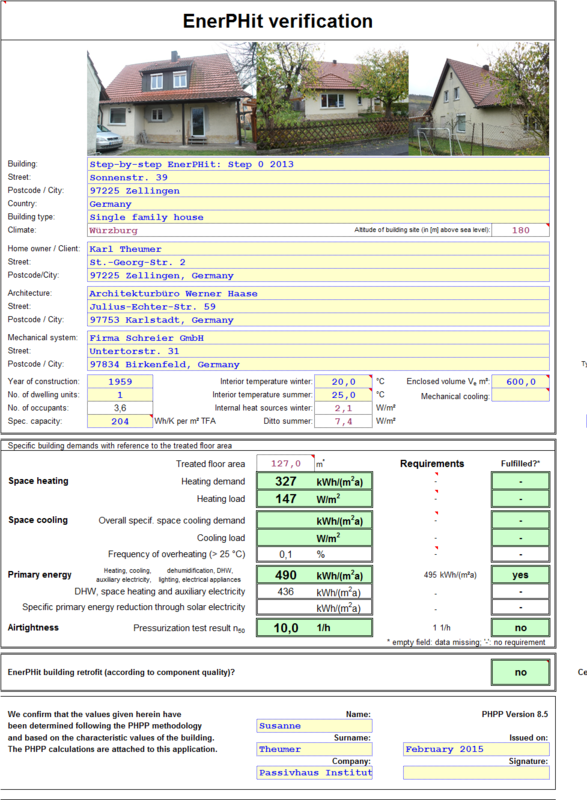 The implementation of the EnerPHit-Standard is done step by step. The aim of this modernisation was to do a "step 1" towards the EnerPHit-Standard. thermal bridges (balcony slab; entrance steps; reveal) addressed by applying external insulation (EPS with lambda 0.032, 240mm). shafts with thousand cables: to ensure airtightness, gypsum was poured into a base of spray foam in order to seal the gaps between cables. The works were completed in early 2014. The first energy bills prove the success of the measures. Time constraint: Most of the retrofit interventions are being carried out with the house occupied by the new tenants. This has affected both time schedule and work procedures (to limit disruptions of occupants´ daily activities), with likely effects on budget. 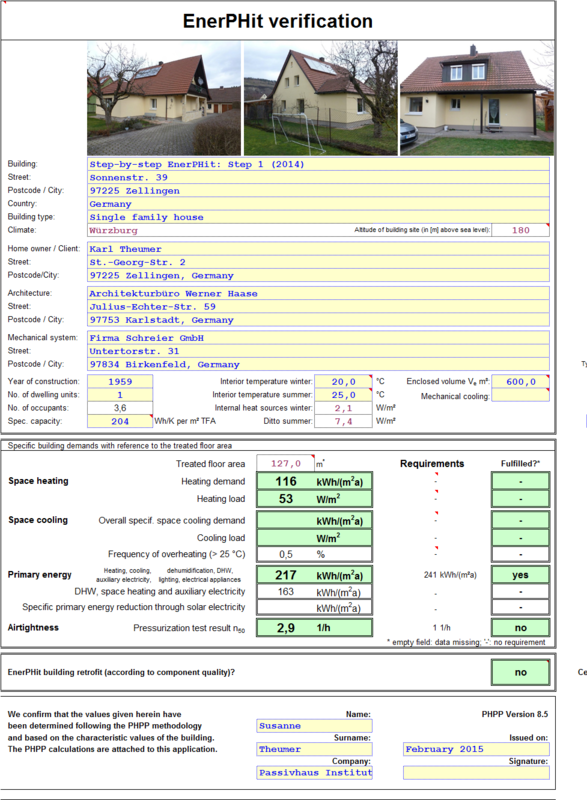 Airtightness: Construction features of the existing building make the PH target for airtightness difficult to achieve. Indeed some areas of the roof (junction between rafters and perimeter walls) are concealed and not accessible without removing the internal lining (which is outside the scope of the retrofitting planned for this work phase). The continuity of the exterior airtight layer could not be ensured between exterior walls and roof along the eaves because it could not be accessed. Thus, air leakages could not be completely removed, with negative effects on the overall performance. Existing windows within the insulated wall: The existing windows were installed in 2004, thus will not be replaced with PH windows during this renovation phase. Besides the low performance, also their position within the exterior walls is not compatible with the new wall layering including 240mm EPS exterior insulation. To overcome this issue, new timber frames had to be installed to cater for future PH window installation. PHOTO SERIES: Window detailing: Existing windows with new roller blinds and new facade insulation.